A look at the theories of Lord Raglan. A potpourri of failed copycat Christs. Is the god of wine a match for Jesus? Attis is another pagan Christ by sleight of semantic hand. Parallels between Jesus and these Egyptian deities requires imagination -- and obfuscation. 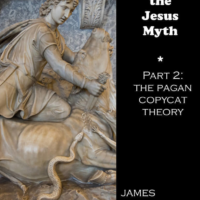 Jesus didn't borrow from Krishna -- it was the other way around! Claims that Buddha was an imitation Christ are based mostly on semantic sleight of hand. Zoroaster's data is much too late for him to be a copycat Christ.